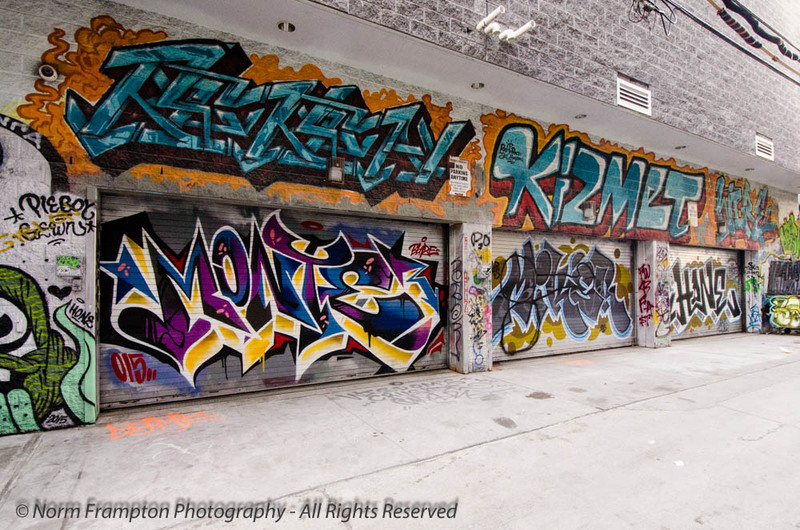 This post is a continuation of my Doors post a few weeks ago from Graffiti Alley in Toronto. No door on this last one; just another shot of that one building from the last post, that was done entirely with an underwater theme. I can’t even imagine how long this would have taken to complete. 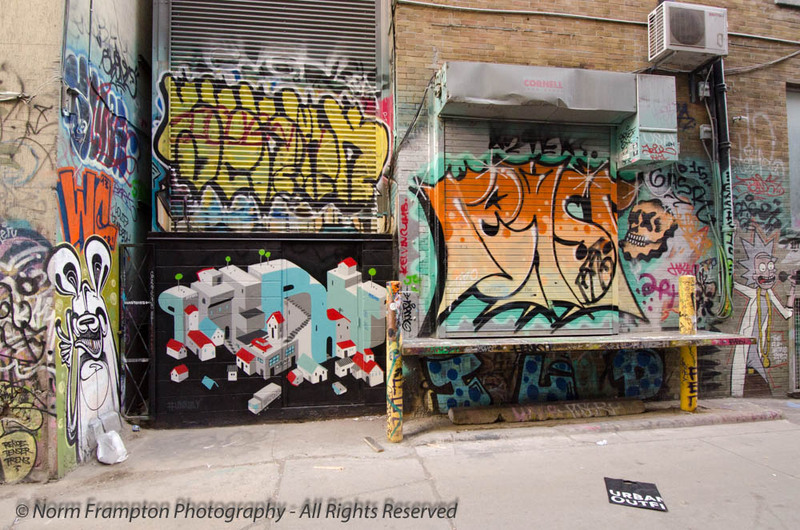 Gallery | This entry was posted in Photography, Thursday Doors and tagged Doors, Graffiti, Graffiti Alley, Photography, Rush Lane, street art, Street Photography, Thursday Doors, Toronto, urban art, Walking Tours. Bookmark the permalink. If I ever get to Toronto,I’ll be heading there. I love your door posts. I posted this door on my blog. http://jadesuttonart.com/2016/02/10/tasting-room/ Norm 2.0 thanks for finding my post. Welcome Jade, I’m glad you decided to join in! If you click on the blue button above you can add your post to the link-up list with everyone else’s and you can see everyone else’s entries from there as well. Isn’t it great when you can relax and just enjoy time with your camera? Wow, I have never seen anything like this. I can’t imagine how long some of those walls must have taken to paint or the supplies involved. 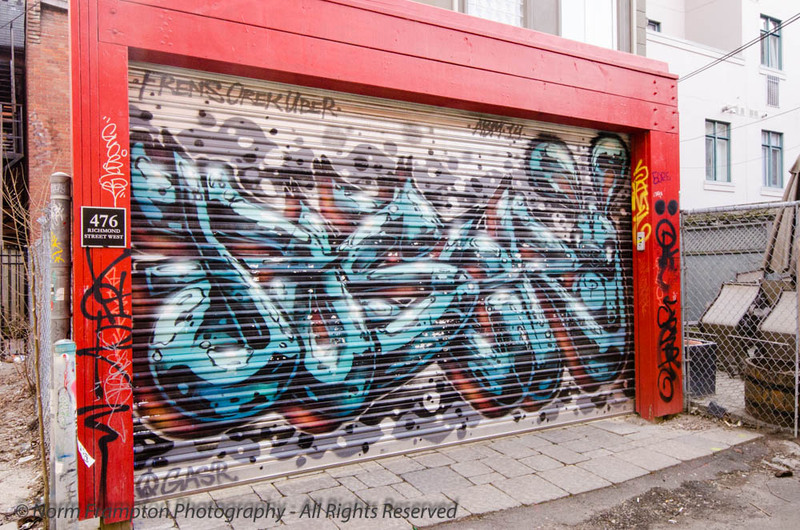 You’ve found some very colourful and artistic graffiti here. Thanks for joining in but this seems to link back to my blog??? Okay I found the right URL and fixed it. Hmm I must have clicked the wrong link by mistake. Can you delete that comment and I will come with a new one. I still love the front with the fishes the most – so fun, like one is underwater;) Have a great weekend! I agree. That one is astounding. I can’t imagine the hours and hours of work that went into creating these works of art! It really does require an amazing level of dedication. So cool Norm, all of them, really! 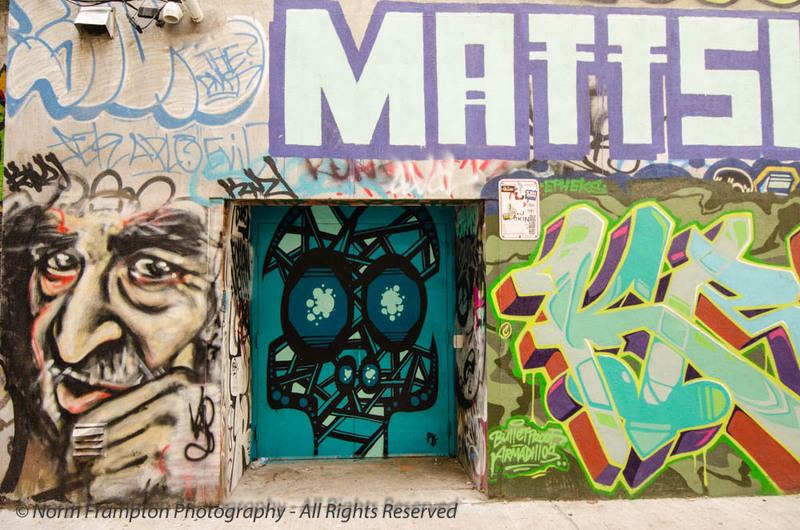 I have to go to TO and walk graffiti alley. Several of the doors in this collection are blended in so well you really do have to look for them! Great artists, and series Norm!. Thanks, I had a lot of fun with this one. 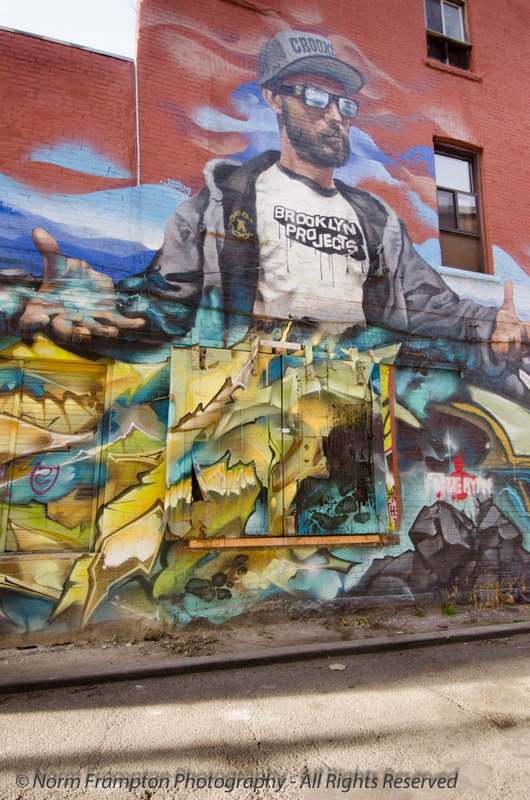 Again, some awesome captures of street art. The second photo in particular is superb – the lines of connecting walls with the doorway subtle and blended into the overall painting just right, along with the contrast of the mainly black / grey colored wall with the swirling vibrant colored wall. Thanks. Yes that’s one of my favorites too. The more I stare at it, the more it draws me in. 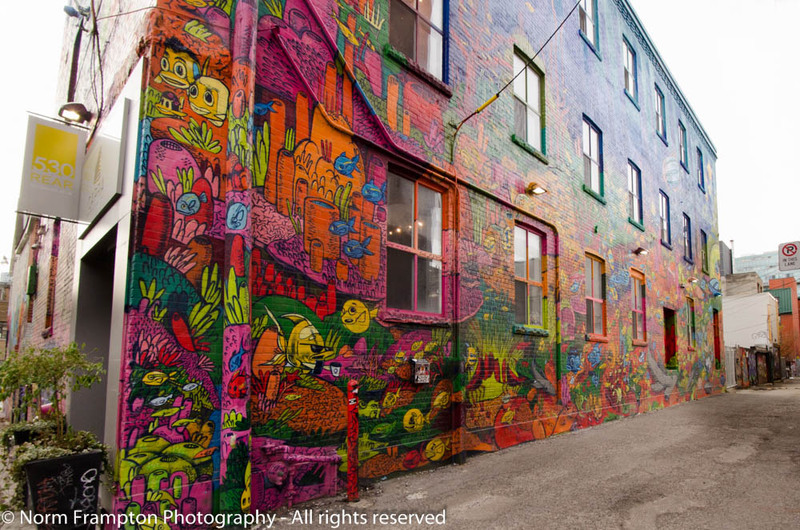 What an explosion of colour in these works of street/alley art! There’s so much of it concentrated in one place that after a while I didn’t know where to look. Very talented artists indeed! I can only imagine the hours and hours of work. Great captures. I agree; there are some very passionate and talented people producing this art. That seals it! 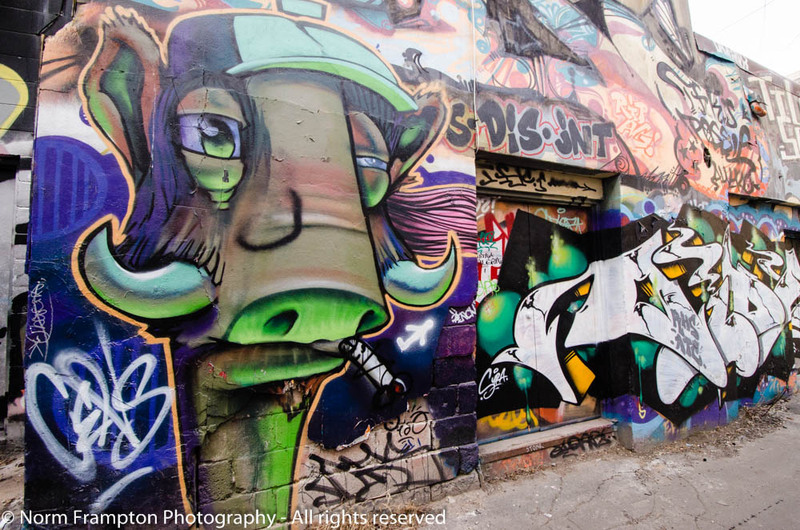 I definitely want to get down to Graffiti Alley as soon as possible!! Kidding aside; pick a mild day, wear comfy shoes, and don’t forget the camera – it will be worth your while. Then it definitely won’t be this weekend. It’s FRIGID!! Thanks for sharing the rest of that underwater building. I can’t imagine, either, but I love the full, brightly-colored design! 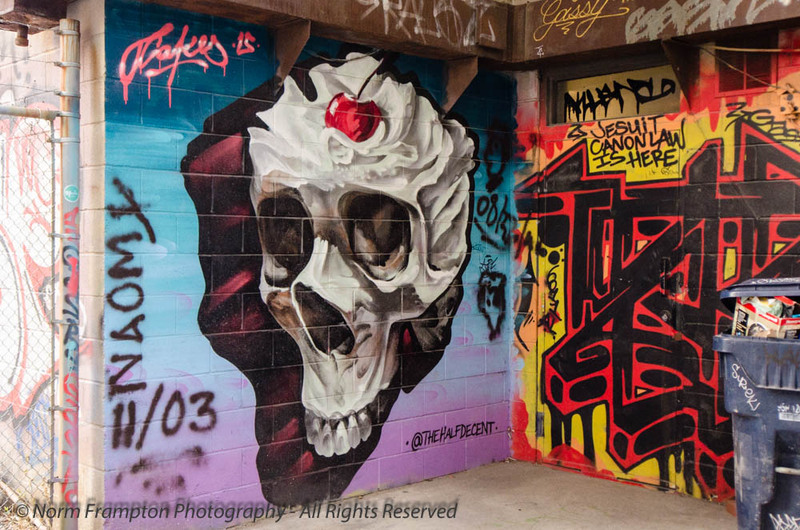 Great graffiti! 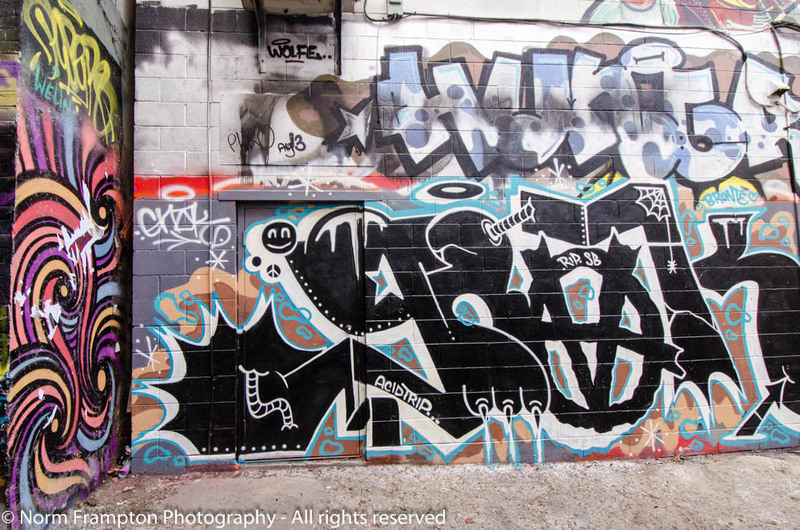 Some real talent on display in that alley! As mentioned, incredible talent out there. I love the underwater mural. Reminds me of some puzzles we have. That underwater scene is one of my faves too, it has hundreds of elements in it; truly amazing work. 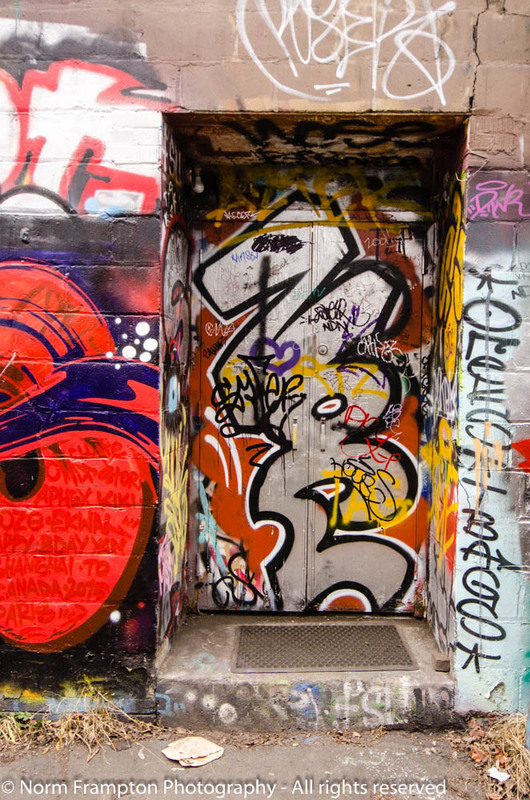 Thanks for sharing another amazing collection of city doors Norm. Some of these are very well done, you really do have to search for the door. Thanks you. Yes, these people are truly talented artists. Funny you should say that Judy; one street artist I follow on Instagram posts pics of his whole process and takes you through his projects step by step. It is amazing the amount of work, prep and planning that go into some of the larger murals. I am always amazed by the amount of work behind these paintings! I know, there is a dedication and passion in some of these works that really shines through.